Borders in Central Asia are the world’s biggest pain – prepare yourself for hours of messing around in the baking heat, with endless forms to fill in by hand. It took us three hours to exit Kazakhstan, and that’s one of the more relaxed countries! As you approach the Chinese border from Kyrgyzstan it all looks very formal with soldiers on guard, but you’re in for a pleasant surprise, because virtually no foreigners arrive by bike. That’s not entirely surprising, because you have to jump through so many hoops to get permission to ride your motorcycle into China. In fact, GlobeBusters is the only company to bring tourists into the country riding their own machines. 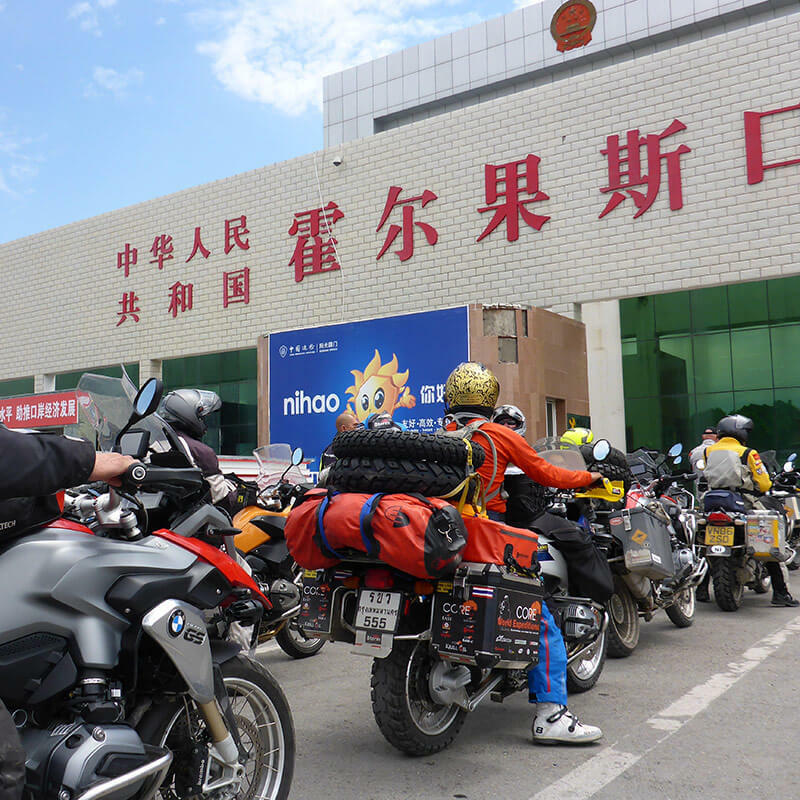 The Chinese authorities demand a photo of you standing next to your bike and holding the registration documents, three months before your arrival date. Routes need to be approved in advance and you have to be accompanied by authorised local guides. There’s more, but you get the picture. So when you roll up on a big capacity motorcycle, which is another rarity, you’re treated like a superstar. Normally at borders cameras are forbidden – try taking a photo and it’ll be deleted; you could even be banged-up for spying. In China, the biggest communist state in the world, it’s the complete opposite. Everyone wanted their photo taken with us – customs officials, army officers, policemen, cleaners, the lot. It took us a couple of hours to get through, but most of that was taken up with snapshots. Right across China, people are pleased to see westerners. Apart from in the major commercial cities, we’re a rarity. Exotic. They’re fascinated by our ‘round eyes’ and height – we’re relatively tall compared to most Chinese – and if you’ve blonde hair or blue eyes then you’re into supermodel territory. Having ridden across Central Asia for several weeks, the culture feels much the same whether you’re in Azerbaijan or Uzbekistan; it’s all mosques, vodka and meat on a stick. Your first proper meal in China is like a flavour explosion, with lots of different meats and a selection of vegetables. However, it’s not all positive. Breakfast is something that most of us could not adjust to. Imagine left overs from a Chinese banquet served cold the following morning. Oh, and the Chinese like a warm drink with their meal. Not tea, which you might expect in China of all places, but orange juice. Warm orange juice with cold noodles! Then there are the three esses; slurping, spitting and smoking. Everyone’s at it, everywhere, all the time. Chinese people slurp soup and drinks. Spitting in public is completely normal – remember Spit the Dog on Tiswas? That’s the preferred technique. And smoking hasn’t been banned, so restaurants are fuggy places. China is a country of extremes – you ride past farmers in the paddy fields, up to their knees in water while they harvest rice, or ‘herding’ ducklings along the roadside; next you’re in a modern city with 10 million other people. When we parked in the public underground car park in Chengdu our bikes were beside Bentleys and Ferraris – more luxury cars than you’d find in Park Lane. At night the city is lit up with neon, like a gigantic version of Times Square in New York. The next morning you’ll find people quietly practising Tai Chi in the park. One thing we did notice in the cities was fat kids. It’s a stark contrast to rural western China; where people are quite poor, the diet is simple and children are all slim. With western fast-food chains popping up in the major cities, and more disposable income, it looks as if China is catching up with the west in more ways than one. The pace of road building is unbelievable. Motorways are being constructed straight through mountain ranges, the carriageway hugging the mountainside on giant concrete pillars, then disappearing through tunnels that would make Swiss engineers jealous. Yet in Western China they have a strange custom that bikes can’t be filled directly from fuel pumps at filling stations, because of the “danger”. Of what? Who knows? You just have to accept it, park a few metres away and the staff will ferry fuel to you in 10-litre ‘kettles’. That just about works on a scooter but when you’ve a dozen big capacity motorcycles with 30-litre tanks to fill, it’s not exactly efficient. Or safe. You’d expect a communist state to be very controlling and in some ways it is. No one criticises the government. And don’t even think about starting a political debate. On the positive side, there’s no sense of crime – we certainly felt way safer than in Albania or Georgia – but there are NO RULES on the roads. Seriously, you can do whatever you like. Break the speed limits, go the wrong way down a one-way street or ride on the pavement. Policemen will calmly watch as drivers run a red light. You have to experience it to believe it. We always offer a reward to the first person in the group who breaks their horn. You’ll be leaning on it from dawn until dusk. If it moves, honk at it! The only country where we’ve experienced anything like it is India.